Q: What made you want to become a blues musician? A: I just sort of happened on the blues. I have been performing on stage since I was five years old, starting out as a singer and tap-dancer. When I was 12 my dance teacher told me I would have to take ballet lessons and so I quit dancing and bought my first guitar. (I just couldn’t imagine myself in tights.) That was in 1959, and I first learned to play stuff that I heard on the radio, 50s pop, Dion, Del Shannon, etc. Then the 60s came along with the folk music explosion, and it was there that I was first exposed to the blues. Not real down home blues, but the kind that we white kids sang around the campfire, like John Henry and Frankie and Johhny. I got really into Dylan and the whole New York folk scene, and came across a bit more of the blues there with Dave Van Ronk, the Reverend Gary Davis and Spider John Koerner. But I must say that the blues stayed a minor part of my music through college and my years in Vancouver, Canada. In some ways I was still exploring new things, growing as a writer and developing a personal style as a composer. Then, in the early 90s, when I had returned to New Jersey, I began to notice that the blues, at least as I saw and felt it, was becoming more and more a part of what I wrote and performed. In 1994, when I was speaking with my first club owner in Spain, he asked what kind of music I played. I had always avoided a straight answer to that question, afraid, perhaps, of locking myself into a style I could not escape. But at this point I had begun to realize that it was completely possible to find room and space within the “big box”, as I like to call it, that is the blues. From the Delta to Chicago, from Texas to New York, from Piedmont to San Francisco, from New Orleans to London, it was all blues and it was all territory waiting to be explored. So I smiled and said, “I play the Blues.” And he said, “Cool, I like the blues.”. The rest is history. A: I suppose that question means what well known players had an influence on my playing and writing. The truth of the matter is my major influences have always been my friends and co-workers, the hard working musicians I have known and played with all my life. Oh, there were some early pushes from guys like the Reverend Gary Davis, Dylan, The Beatles, and some guys who made me question what I was doing, like Mingus and the Bird, Bill Evans and Les Paul, and there were a bunch of Classical composers who really opened my ears, from Bach to Brahms, from Debussy to Schoenberg. But there were three players in Vancouver that really influenced me a lot. 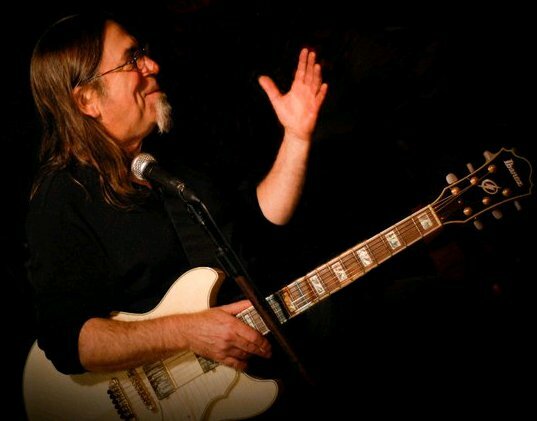 Pat Coleman, one of the world’s finest guitarists, told me to always remember that whatever note I played I was only a half-step away from a great one. Joe Mock, singer-songwriter extraordinaire, taught me that the difference between a live performance and a recording is the mistakes, and that they are ok. And Robbie King, unfortunately no longer with us, one of the most incredible Hammond organ players who ever lived and a brilliant arranger, said that sometime the rhythm of what you play is more important than the notes you play. Q: What is the biggest difference between the music business in Spain and the music business in America? A: For me the biggest difference is that very often people don’t understand my lyrics. I have always been very much involved with the words in my songs, they most often precede the melodies. I had to learn that if what I was doing onstage musically was honest and truthful, if the music reflected my feelings as much as the lyrics, then the audiences would respond, even without knowing what I was singing about. Of course, the other obvious difference is the size of the market, Spain is a small country and the possibilities of making a living playing the blues here don’t come close to the U.S.. But for its size, the number of fans, clubs and festivals is quite large. I think it has something to do with the Flamenco tradition; they are like first cousins, in both forms people end up feeling better listening to others sing about their pain and troubles. Q: What is the strangest thing that ever happened to you when you were on tour? A I think the strangest thing ever was a short tour I did in the Bay Area with an harmonica player who shall remain nameless. He was recommended by a friend and so I booked a weeks worth of gigs with him as an accompanist. His playing was barely adequate, but I could have lived with that. It was his tendency to stop playing and answer his phone on stage that blew my mind, and his incomprehensible habit of shouting, “Get Down!” and “Right On!” in the middle of songs that blew me away. Needless to say we have not worked together again. Hehe. Q: . What makes the blues unique? A: The blues, as a musical form, is the result of a mix of cultures, African tonalities and poly-rhythms mixed with western European scales and hymns. That created a disquieting basis for exploring, both musically and emotionally, the human condition. This form gave rise to both Jazz and Rock and Roll, all three of which are uniquely American, a mixture of black and white influences, of strict rules and improvisation. And it all began with the blues. Q: . What gives you the blues? A: Ok, here we get to one of my favorite discussions. What is the blues? I have often written of the blues as a person, a demigod if you will, that for some reason enters into the life of someone and unexpectedly alters the course of their life or the way they see the world. This is a common concept going all the way back to the roots of the blues, songs have depicted the blues as an old friend or an unwelcome visitor. In this sense, the blues is something that is outside of your control, a force to be reckoned with. Ok, so it is more than a style of music, it is an emotional state. So, if you ask what make me blue, I guess I am like everybody else…loss of a lover, death of a friend, getting old, being poor, being helpless, all of these things give me the blues. But playing the blues doesn’t give me the blues, in fact it makes me feel better. That is the crux of the matter. A: I have tried to express as many emotional and psychological things as I can with my music. All of that and more- or at least I try. Q: .What was the greatest blues album ever made? A: I think you will get a different answer to that question from every person you ask. The different geographical styles, the time in history, the instrumentation, the singer’s voice, these will all give some folks reasons for choosing one album over the other. I think I would have to say that the Collected Recordings of Robert Johnson is probably my choice because it is the basis of so much of modern blues. His words, his picking style, the story of his life and death, all of this resonates strongly with the contemporary scene as I see it, giving instruction to the novice and confirmation to the experienced player. So much has been written about his deal with the devil at the crossroads that it has become a part of the skeletal structure of the blues, the very bones of the blues you might say. And as a role model he seems to have influenced a multitude of greats who died as young as he did, and lived as wild a life. But the Muddy Waters At Newport album is at least as important, and along with The Reverend Gary Davis’ Harlem Street Singer, it merits a high place on the list of bests. A: I am basically self-taught. When I bought my first guitar a family friend who played a bit showed me how to play five chords. Fortunately they were the ones I needed to get started, and then by ear and books, I got to the point where I could play enough to start writing. Again, in Vancouver, I had the great fortune to play with some of the best players I have ever found anywhere in the world, and it was impossible to be around them without absorbing some of their knowledge and practical tips. That and just hours, sitting around playing, fighting with it, caressing it, yelling at it and loving it. I have a daughter who is a classical violinist, she can run rings around me as far as reading music and theory is concerned, but she still comes to me to ask how it sounds, hehe. Q: Who is in your fantasy band? A: I have always wanted to play with Bonnie Raitt, and Ry Cooder. I love the way Paul McCartney plays the bass, and Stevie Wonder is one of my heroes on both the harmonica and the keyboards. Let’s add the back up singers from Daptone Records and the sax player from that song Baker Street, and Duris Maxwell, a Canadian drummer who has played on a lot of big recordings. But the reality is the guys on stage with me at any given minute, the working players that keep it happening wherever you go, they may not be famous but it would be impossible without them, and I thank them all.